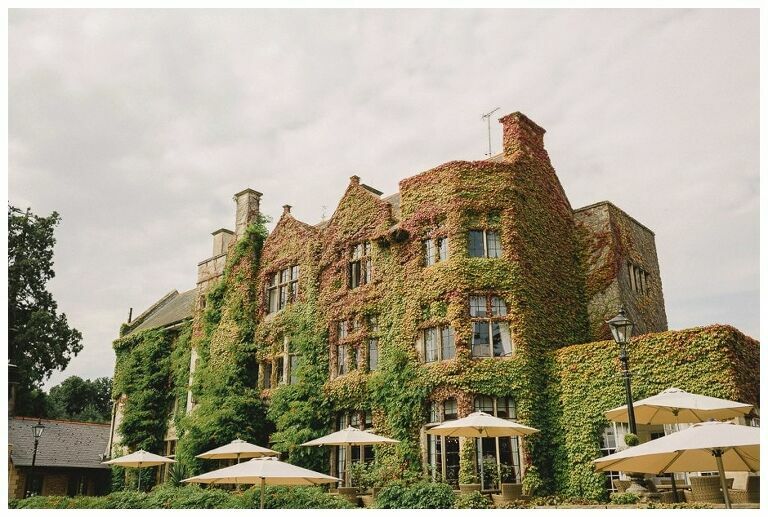 Hannah and Rob’s wedding was held at the very exclusive Pennyhill Park Hotel & Spa. Hidden within 123 acres of stunning parkland, Pennyhill Park in Surrey is the perfect wedding venue that always makes for amazing images. With it’s ivy clad exterior, the 19th century Mansion is surrounded by beautiful garden terraces, formal lawns and colourful flowers in every bed. The lovely couple opted for a very intimate wedding with their closest friends and family members and I was thrilled when they asked me to come along to document their big day. As both Hannah and Rob were both staying at the hotel the evening before I was able to dash between the two rooms to capture each of them getting ready and it was lovely to meet their son too who kept everyone thoroughly entertained throughout the day! After a tearful ceremony everyone headed out on to the lawn for canapes and champers and with the Summer sun in abundance this made for a really relaxing afternoon. I took the newlyweds around the beautiful grounds for some natural shots of just the two of them was I was absolutely thrilled with their comments they wrote at the Wedding Industry Awards 2017…….